The Syrian war which sprung from a civil one to an international de facto conflict between dozens of nations, reaches a climax. In May 2015 the Jihadist forces spearheaded by Al Nusra managed to get a hold of most of the Northern Idlib province, whilst in the South more than 20 different groups are waging attacks aiming at infiltrating the Syrian Army's defense lines that led to Damascus which is firmly under governmental control. In the meantime the Kurdish YPG, with the assistance of other Kurdish groups from both Turkey and Iraq are steadily advancing against the Islamic State, while the Syrian Army with the vital assistance of the Lebanese Hezbollah has managed to inflict great casualties to the Jihadists who are based in the mountainous ranges between Lebanon and Syria. In addition the Iranian state is gradually increasing its involvement in the battle field by sending more men and arms to Syria to fend off attacks against Damascus. All the above signal a renewal of fierce fighting in the country and heighten the alertness of any sober international observant as to what has to be done to put an effective stop into the carnage and nullify any danger for a spread out of the crisis into the rest of the region. First of all it has to be noted that the renewed advance of the Jihadist forces, none of which can be logically assumed to be "moderate Muslim one" is enforced by ample ammunition and a mercenary flow from Turkey, originating mainly from the Gulf States and Saudi Arabia with the tacit support of France and US. - Massive massacre of millions of Alawites, Shia, Christians and pro-Assad Sunnis, in fact 15 million people would be in immediate danger. - Massive refugee wave in Lebanon, Turkey and Jordan. Already according to UNHCR the total number of Syrian refugees has reached 4 million people, thus any deterioration in the situation in the ground will augment these numbers dramatically. The majority of the people move gradually westwards to Greece, Balkans and to the EU. Coupled with the unrest in Libya plus the ongoing wars in Iraq and Yemen, one could imagine the impact of the incoming immigration "wave" to reach Europe in the short and also mid-term. - Massive cultural and antiquities destruction. Already the “Syrian Human Rights Watch” NGO has confirmed that the Islam State has mined the entire Palmyra ancient site, which is a prelude of what is coming to. - Imminent destabilization in Lebanon, once Damascus fall, Lebanon will be overrun by Jihadists, leading in a renewed civil war in the country between various factions and ethnic groups. Consequently Israel and Jordan will be affected one way or another and most certainly not a positive one. - Radicalization of Iran and the Shia communities across the Middle East. Should Syria falls into the hands of Sunni Jihadists; the Shia communities will be further radicalized, getting into a whole-hearted fight against Sunni regimes in the rest of the region. What may happen after this would constitute a major catastrophe in all terms. - Islamic originated terrorism in the Western countries will also be boosted, since the war on the ground in Syria is portrayed by the jihadists as a war against "infidels". Thus a win by the Islamic State and/or Al Nusra and the other bands will result into "phase 2' which is strikes in the heart of the West, as recent examples have also showed recently in countries such as Australia, France, Austria, Belgium and many other attempted strikes. - Great danger for the destabilization of Saudi Arabia will also become present, which is already battling the Shias in Yemen. The Jihadists view the House of Saud negatively and boosted by a potential victory in Syria they will attempt at least to make inroads in S.A. Already various cells operate there and stage terrorist attacks periodically. -Destabilization in North Africa and in the regions of Sinai & Egypt, Libya, Sahel and Algeria. This vast area is already filled by myriads of Jihadist groups that are in contact with the Islamic State first and foremost. 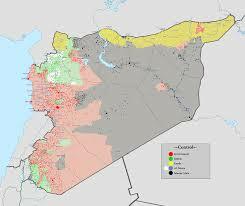 A win in Syria will mobilize them to become more active into subverting secular governments in that region as well. Once situation unfolds it would not be possible to be contained unless a massive and long-term force by multiple countries puts boots on the ground in the MENA region and for years to come, scenario not possible due to diplomatic, geopolitical and budgetary restraints by all Western countries. As an effect a massive destabilization in the energy index could be expected with untold consequences for the EU countries mostly. - A modus vivendi on the wider balance of powers in the Middle East should be reached between concerning parties, through a grand international forum resembling the 1815 Vienna Congress, which quite conveniently could be assembled in Vienna, again. It is certain though that nothing of the above will materialize. The war will drag one and the consequences mentioned are surely to be taken into account as a mere certainty or as "Kismet".